This entry was posted on 16th August 2017 by Tom Richardson. On the 29th May, the anniversary of the first ascent of Everest, I completed the Tenzing, Hillary Everest Marathon (THEM) Ultra Extreme 60K. It was my 3rd attempt, having entered in 2015 but abandoned due to the earthquake. 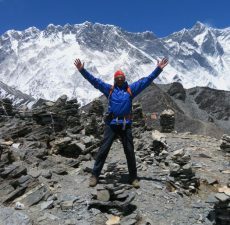 In 2016 I lead a group to Everest basecamp but was unable to run after helping an aspiring runner with an artificial leg onto a rescue helicopter on Race Day. This year there were some 200 competitors on the standard Marathon (which I completed in 2013 and 2014) and just 14 for the Ultra. I met them for the first time on the start line on the Khumbu Glacier (5330m) at 6am on the 29th May. Some may have been famous in their home country. Nationalities included a Russian, Japanese, Australian, Americans, about half a dozen local Nepali and an old fella from the UK, standing at the back wondering if he’d made a mistake. There was talk of having trained in altitude chambers. Some professional endurance athletes listed all the other ultras they had completed, whilst I shuffled about looking at my shoes. My aim was to be the oldest and probably slowest to finish the Ultra. However, I wasn’t in the end. The first few KM are on the ice of the Khumbu Glacier and by the time I’d reached the steep moraine leading from it, I had lost sight of the others ahead of me. I also felt rough, unusual for me having had to urgently visit the toilet tent several times in the night. The first quarter of the route once off the Khumbu Glacier was straightforward and I covered 15Km in about 3hrs. Mostly descending I reached the village of Pangboche in a further 2hrs. The altitude written on the lodge wall was 4000m. Here my friend Nepalese Doctor Rahot was at the check point. I told him how I felt, he smiled, dug out a Snickers and a Gel from my pack, gave me an apple and told me I'd be all right. He said the other Ultras were only 2 hours ahead! I was joined here by Krishna, a volunteer local chap (20yrs old) to support me in the next long and dangerous leg. The 15km long loop up and down the Gokyo Valley to Nha La at 4400m. If these facts were not bad enough the path was mostly no more than 80cms wide and above sheer drops of 100mtres. After Phortse, Krishna said he would drop down, cross the bridge and meet me on the way back down (yeah sure I thought). I struggled on in full bad weather gear in the cold wind and some rain following the red flag markers across the middle of nowhere and finally reached the bridge at Nha La at 5pm (11 hrs in and 1hour short of being timed out). The bridge lead me to familiar ground, the trekkers trail to Gokyo. I soon reached Machermo settlement at 4413m. The settlement is in a shallow valley and as I puffed my way out I heard voices calling me. I looked back and saw two other Ultra runners from Australia and USA coming behind me. At first I wondered if they were on a second lap! We continued down together and amazingly an hour later Krishna, true to his word reappeared to help. At Dole settlement it got dark ,but between us we had enough headlights to keep going down through the forest and across torrents to Portse Tenga (the bridge where Krishna crossed). The worst was yet to come though and I knew it. It was the hour or more of steep climbing back up to Mong La pass at 4000m (but seems like a week). At about half height my Australian companion, tucked in behind me at my slow pace, said that he thought the hill wasn't too bad, 20 mins later he asked if it was far to go, then after another 10 he sat down (to wait for his friend from USA) he explained. Then Shikar Pandey, the organiser phoned to check I was OK. "Fine" I said just completing the race, "see you in a couple of hours". From the Mong La, Krishna and I took off at a brisk downhill walk leaving the others. They were OK with their Minders and we could, with a bit of imagination smell the finishing line. Eventually we reached Namche Bazaar (3400m) and crossed it at 11pm or thereabouts. All the officials were gone, nobody to hand out medals or give me the snazzy 1970s style official track suit. Only Shikar was there in a small tent with his lap top and a headlight. "Well done Tom Dai "he said, "Would you like a beer?" “Some water would be great if you have some "I croaked. Krishna and I shook hands and went our separate ways.